A Joshua tree wields serrated blades to repel invaders. But the yucca moth is undeterred. Seduced by a succulent flower, the moth flits by hedgerows of sword-like leaves. She shrouds herself in white petals, and the ancient ritual begins. The dusty grey insect follows ancestral instructions imprinted in her genetic code. Stakes are high: Her children’s lives are on the line. Complex relationships among flowering plants and pollinators shape nearly every aspect of modern terrestrial life. Flowering plants are our food, shelter, clothing and medicine, yet fundamental questions remain about their sudden diversification 100 million years ago. New research into the Joshua tree genome suggests that evolutionary pressures among pollinators and plants may be part of the answer to Darwin's mystery. Coevolution occurs when one species’ evolution affects the evolution of another species, which, in turn, affects the evolution of the original species. By eating slower gazelles, cheetahs reduce the overall number of “slow” genes in gazelles’ gene pool. Fast gazelles put pressure on cheetahs to speed up, which, in turn, puts pressure on gazelles once again. The cheetah’s explosive sprint and gazelle’s nimble leap were shaped by a coevolutionary arms race over millennia. Unlike the evolutionary footrace between cheetahs and gazelles, yucca moths and Joshua trees have a special type of coevolutionary relationship known as an obligate mutualism. Each partner depends on the other for survival. Only yucca moths pollinate Joshua trees; in turn, Joshua trees serve as nurseries for moth larvae, which feed on the plant’s seeds. But there is a twist — two of them, actually. There are two species of Joshua tree and two corresponding species of yucca moth. The pairs live in different Southwest neighborhoods, but their territories overlap in a 60-mile stretch of desert in Tikaboo Valley, Nevada. A few hours drive from Las Vegas, the remote desert ecosystem serves as an outdoor laboratory for Chris Smith, an evolutionary biologist and professor at Willamette University. With funding from the National Science Foundation, Smith has collaborated for nearly a decade with other researchers, undergraduate science students and citizen-scientist volunteers to gather and analyze field measurements, to decode the Joshua tree’s genome, and to look for genetic signatures of coevolution between Joshua tree and yucca moth. While speculation goes back to Darwin’s time about insects’ role in arranging Earth’s flowering bouquet, major challenges have stymied efforts to demonstrate that pollinators drive speciation — a notion that’s inconsistent with the prevailing theory. 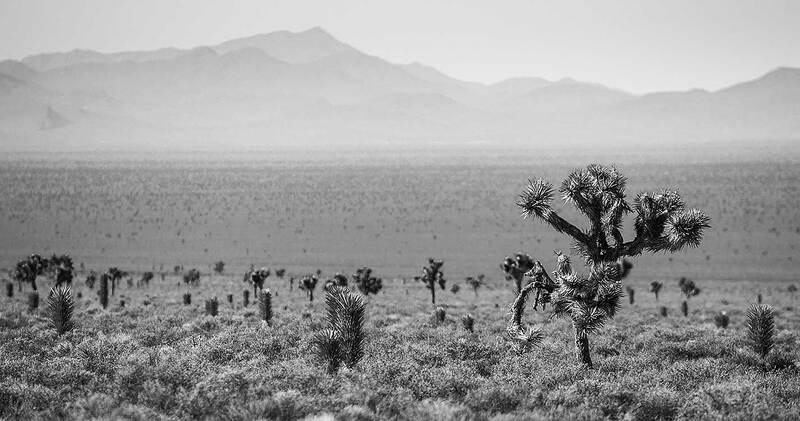 Because changes occur over many generations, observing evolution is particularly challenging for long-lived organisms like the Joshua Tree that might not reproduce or reach maturity for decades. Likewise, systems with multiple pollinators can confound scientists trying to determine the effect any one pollinator species has on a particular plant species. “Many plant-pollinator interactions are among generalists, where both parties have other choices,” says Anne Royer, an evolutionary ecologist and postdoctoral researcher responsible for genomic analyses. Royer relies on Joshua trees’ exclusive pollinator relationship and hybrid zone to winnow the potential field of genetic influences and to identify snippets of Joshua tree DNA associated with a particular trait. Researchers hypothesized that physical differences between Joshua tree flowers were related to a key feature of the yucca moth: the length of the moth’s ovipositor. Moths unfurl this needle-like organ to inject their larvae into the flower’s style – a small tube connecting the plant’s flower and ovules, or unfertilized seeds. One species of Joshua tree produces flowers with a short style. It’s pollinated by a moth with a short ovipositor. The other tree species has a longer style and is pollinated by a moth with a long ovipositor. Smith believes that a cold war between pollinator and plant is pushing the two Joshua tree species further apart. He suspects that some Joshua trees evolved longer styles to make it harder for moth larvae to reach and eat as many seeds. Some moths evolved longer ovipositors in response. The partners avoided mutually assured destruction for millennia through natural selection. Then a million years ago, the genetic seas parted. One species became two. Smith and Royer are looking in the flower’s DNA for clues to Darwin’s mystery. “If the flower is involved in speciation, we should find signs of genetic and structural variations,” says Smith. The team relied on big data tools to track down genetic variations associated with the floral style. To see if those genes were under positive selection pressure from a particular pollinator, Smith and Royer looked for Joshua tree gene variants associated with one moth’s territory and not the other’s. They also looked for gene variants that are rare among hybrids, which suggests selection against those traits. While these powerful tools can uncover relationships in enormous data sets, they don’t show whether a particular genetic variant actually causes the flower to develop a longer style, for example, only that plants with this genetic variant tend to have longer styles. Not only do the Joshua tree and yucca moth offer a clear physical target for coevolutionary influence — length of the style — the exclusive plant-pollinator relationship allow scientists to have more confidence in attributing genetic variation to the pollinator’s influence.